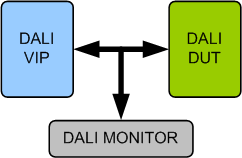 DALI Verification IP provides an smart way to verify the DALI component of a SOC or a ASIC. The SmartDV's DALI Verification IP is fully compliant with IEC 62386-101 Edition 2.0 2014-11 and IEC 62386-102 Edition 2.0 2014-11 Specifications and provides the following features. Supports the two types of frame formats. Allows creation of both random and directed testcases as well as constraints randomization. Supports callbacks in monitor, receiver and transmitter BFMs for user processing of data. DALI Verification IP comes with complete testsuite to test every feature of DALI specification. Functional coverage for complete DALI features. Faster testbench development and more complete verification of DALI designs. SmartDV's DALI Verification env contains following. Complete regression suite containing all the DALI testcases.